Praful Bidwai, a longtime Nation contributor, is a New Delhi-based columnist for twenty-five South Asian newspapers; a social science researcher; a fellow at the Transnational Institute, Amsterdam; and an activist on issues of peace, secularism and human rights. He can be reached at prafulbidwai@gmail.com. 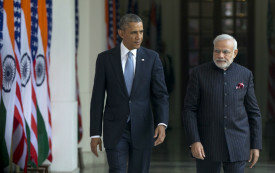 Did Obama Legitimize Extremist Violence With His Visit to India? The president roped once-non-aligned India into a strategic alliance, but only by bolstering the Modi government, with its religious intolerance and pro-corporate policies. The Indian public has long been suspicious of the US arguments for military action against Iraq and the legitimacy of any "regime change" executed by a superpower with imperial ambitions. The events of September 11, viewed from abroad.